Now that it is winter in Chicago I am totally into new pasta dishes. This looks like a great recipe to try out. Happy New Year! that your freeze is empty enought to fit a cookie sheet of cheese…wow…love that…can not stand that mine is filled way too full that I lose site of what I have in there…this meal looks so good and I still have a squash to use up! Happy New Year. I love that you used turkey, love it! Happy New Year!! I would totally eat this for a week straight! I mean you’ve got the whole wheat and turkey so it’s definitely the perfect healthy, comfort-food type dish in my book. I don’t have access to Provolone. In my fridge I have parmesan or cheddar. I really really want to make this tonight. Would one of those do as a substitute? Either one! 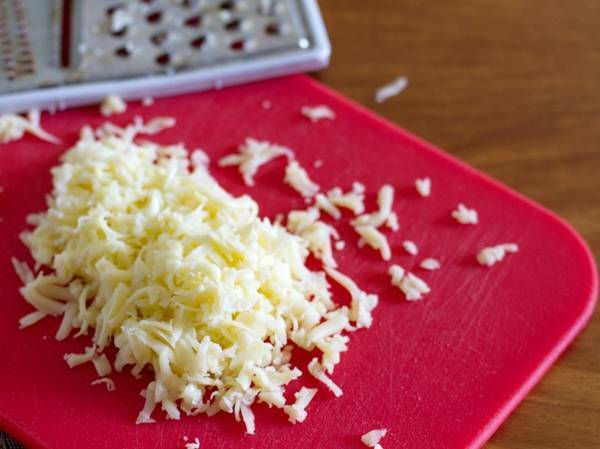 The cheddar will melt more like the provolone did, but I also love the flavor of Parmesan cheese. Up to you! Thank you. I will come back and let you know how it went. This was good, good, good. I had to change a few things to use what I had on hand eg shredded turkey breast and cheddar cheese and man it tasted like heaven. Perfect for a winter’s day (and healthy to boot). Thank you for introducing me to squash sauce. I know what you mean about the spinach. I loved the fresh fruits and vegetables that are available in India, but I really used to miss lettuce when I was there. It was almost impossible to find! And I don’t find your tone to be superior at all. I think what you are doing is admirable, and living in another country is never easy, no matter how well prepared you are. I hope you are feeling better!! It would be so disconcerting to be sick like that in a different country!! Best wishes, my friend! This dish looks delicious, btw! I’m already craving it. . . .
Another great recipe – how have I lived this long without your blog!?? Not only was this a healthy cozy meal on a cold snowy night I had enough leftovers to divide up for lunches for the rest of the work week. Glad you’re feeling better! This looks absolutely fabulous! And cheesy! Just made this again with some sausage instead of turkey. My supper guests finished every last mouthful. A keeper. Thank you. I loooove sausage! I would make this with sausage in a heartbeat if I could find some higher quality stuff here. I bet yours was amazing! Please clarify on the amount of squash. Perhaps by cups or pounds. Thank you. Oh my goodness!!!! I just made this….with just a few minor changes based on what was in my house…..soooooo yummy!!!!! I’m making this right now & the sauce is delish all by its lonesome. My 1yr old & I are eating some like soup as I type. I can’t wait until the whole thing is done! OMG, this dish is amazing! I made it last night not too sure what to expect but it was fantastic! I did cheat and buy the frozen butternut squash but it’s still delicious. Glad you liked it Ashley! Lindsay – you’ve inspired me to make a squash-based sauce for the first time…but given that I haven’t worked with it before (beyond just enjoying squash roasted..yum! ), I am wondering whether I can make this midday and just stick it in the fridge until I bake it. Will the sauce firm up or thicken too much if I do that? I suppose I could add some extra broth to it just before baking if you think it might get too thick. Any thoughts? Thank you! Yes, I think so! Just add a little water or broth if you need to make it a little saucier later on. Thank you! My day fell all to pieces so I was only able to make this about an hour before putting it in the oven. The sauce was still nice and gooey, and it worked just fine. I never told the fam what was in it and managed to get humbs up from all…you should have seen their faces when I told them what was in it 🙂 Next time I may jazz up the meat with a sausage just to add some zing! but otherwise this was FAB! Instructions mention to transfer 1/2 c broth to the blender. What do I do with the rest of the broth? 4 cups seems like a lot. Is that what I cook the pasta in? Hi, Annie. Step 2 instructs you to cook all of the vegetables in the broth. Once you’ve cooked the veggies and transferred the 1/2 c to the blender, you won’t need the rest of the broth anymore.